Sakamichi Onoda is an otaku who just wants to find more people to join the recently disbanded anime club with him. However, when a couple cyclists spy his skill in riding the bulky mamachari bike he's had since youth, they attempt to convince him to join the bicycle racing club instead. An OVA bundled with the 29th volume of the comic book. In this "Episode" you will be watching a small portion of the schools training, (mainly focused on Sohoku) a little while before Inter High at Hakone occur. Should you waste time to watch this? Well why not, you get to know a bit more about Onoda's anime merchandise and relationship with his "Climber Senpai"! Also if you still did not watch the anime, this episode might be a bit spoiler so check the first 20 episodes, before you come watch this! 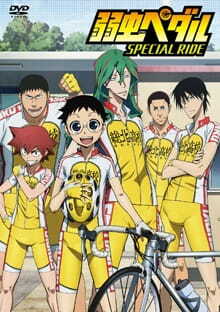 Good points of this special episode is that you get to see a little morel development between a Senpai and Kohai's Friendship, I'm referring to Makishima and Onoda the Team Climbers of course! Is something that got me curious about, since both characters are way to different one from another and they must tag along for almost half a day. For a moment I though, maybe I should not waste time watching this, but half way I though opposite, glad I did. Regardless my score give to this episode, I must say, I did not get hooked up for another anime so much has this one in the past couple of months. If you don't know if its worthy or not, just give it a try! And if I may add, I'm not much of a Anime Sport's Fan myself and nor I like to watch "ongoing" anime.